Whether we admit it or not, pregnancy weight gain is on the mind of so many soon to be moms. Some moms are worried about gaining too much weight during pregnancy, while other moms worry about gaining to little. 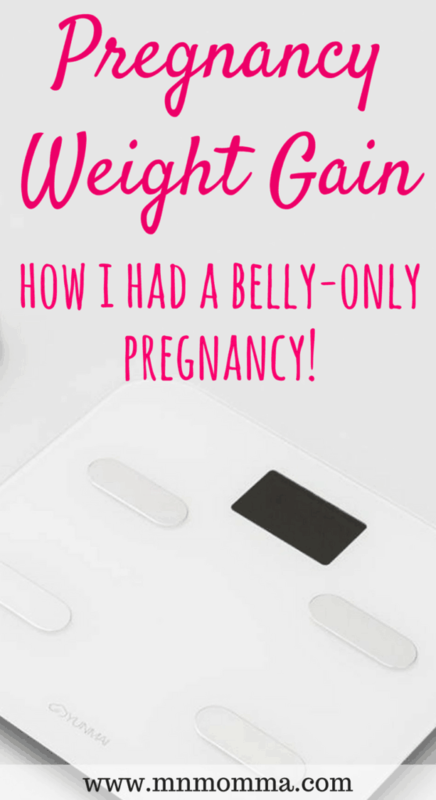 Let’s dive in to how to tackle your pregnancy weight gain the healthy way! 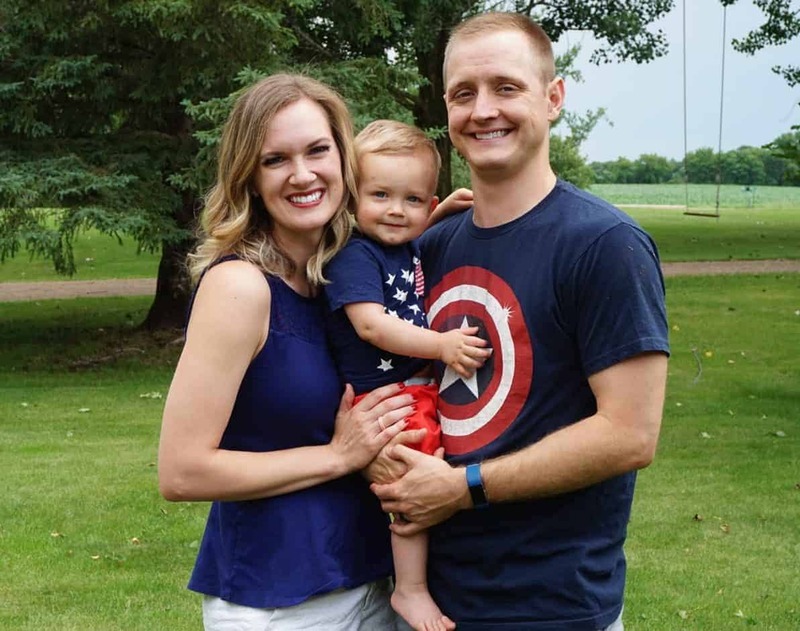 Tip: if you’re worried about losing your pregnancy weight gain postpartum – check out The Postpartum Cure! The app is incredible and you’ll be back on track in no time! 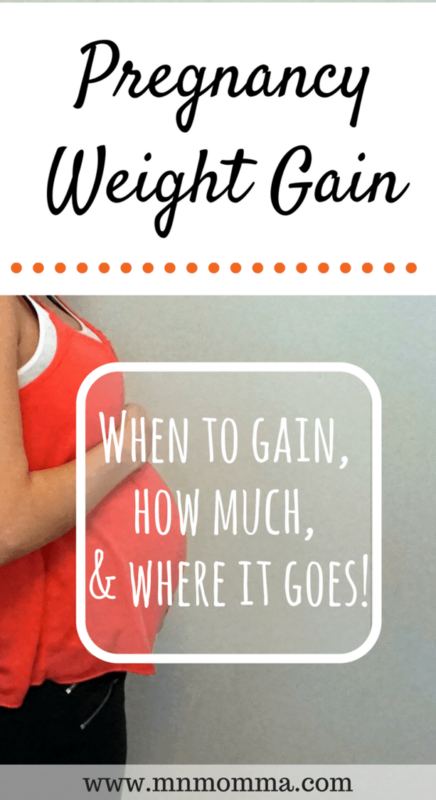 Pregnancy Weight Gain: How Much Should You Gain? Believe it or not, there’s not a specific amount of weight that all women should gain during pregnancy. The guidelines for pregnancy weight gain vary greatly depending on your pre-pregnancy weight and fitness level. If you were underweight before you were pregnant, you’ll be expected to gain more weight than someone who was overweight pre-pregnancy. In regards to pregnancy weight gain, the Institute of Medicine categorizes women into 4 categories based on their Body Mass Index (BMI). The reason BMI is considered, is that BMI is one of the leading ways to assess body weight since it also takes your height into account. To accurately figure out how much weight you should gain during pregnancy, let’s calculate your BMI. To calculate your BMI take your [weight (lb) / height (in) / height (in)] x 703 or use this easy online BMI calculator. 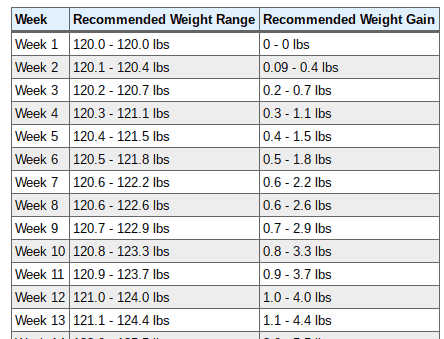 Now that you know your BMI, you can find your category and see the suggested weight gain. You’ll fall into the normal weight category if your BMI is between 18.5 and 25. 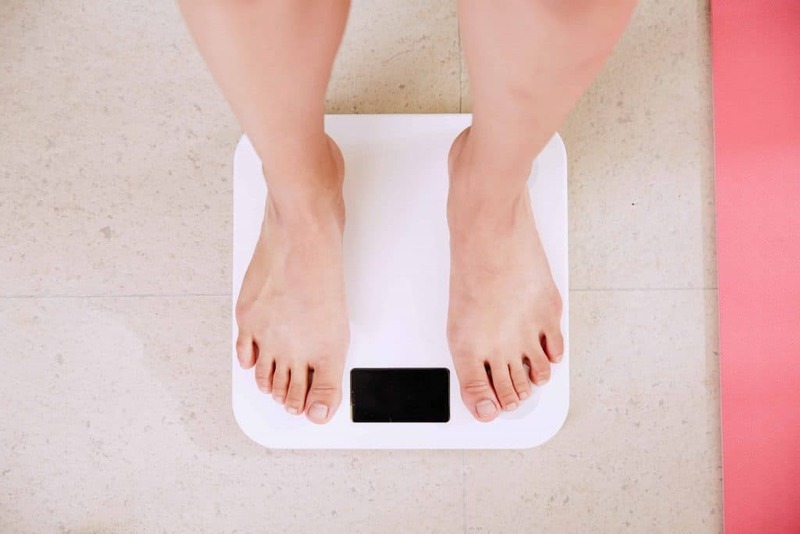 To classify as underweight, your BMI is less than 18.5. 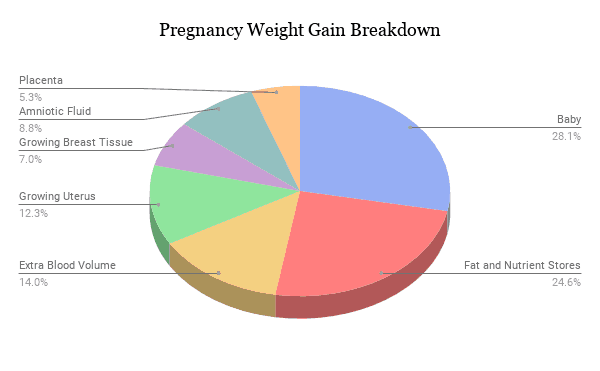 As I mentioned if you were underweight pre-pregnancy you’ll be expected to have a higher pregnancy weight gain. If your BMI is between 25 and 30 you are considered overweight. The CDC considers a BMI over 30 as obese. 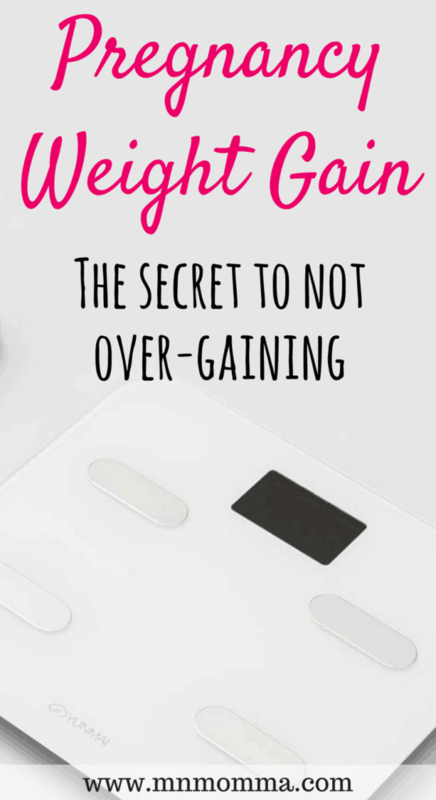 Okay, so now you know how much weight you should gain – but when should you gain it? Your pregnancy weight gain should happen gradually over the course of 9 months. You’re less likely to over-gain or under-gain. If you gain too much weight right away, it can be hard to get back on track and not gain too much weight during your pregnancy. You’ll have fewer stretch marks. When your body and skin can adjust to your growing stomach more slowly, you’ll be much less likely to see stretch marks. Gaining weight too fast is never good for your body. Gaining too much weight too quickly can put added stress on your body. A pregnancy weight gain calculator can be a huge help to determine how much weight you should gain during your pregnancy. Some calculators are more specific than others. They may break down your weight gain by week, month, trimester, or just overall pregnancy weight gain. 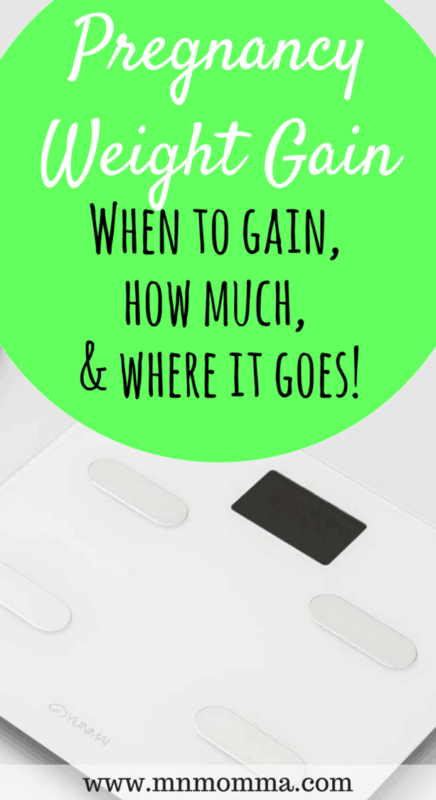 I loved using this pregnancy weight gain calculator that broke down my pregnancy weight gain by week. It’s totally free and easy to use. With my pregnancy brain, I often forget where I’m sitting and check the calculator every so often to make sure I’m on track. For this pregnancy weight gain chart, just enter your pre-pregnancy weight, your height, how many weeks pregnant you are, and whether you’re expecting twins. The calculator than creates a chart for you and helps you stay on track. Here’s how it’ll look! You really don’t need to check your weight weekly, but I’ll admit that I did with my first pregnancy. I did not want to over gain during my pregnancy, but also wanted to be sure my baby was getting everything he needed to be healthy. So why is pregnancy weight gain important? The simple answer is because your baby and your body needs it for a healthy pregnancy, delivery, and postpartum period! Here’s the easy breakdown of where that 30 pounds is supposed to go. Your Baby’s Body Weight (8 lbs) – A full term baby will typically weigh between 6 and 9 pounds. Mother’s Fat and Nutrient Stores (5-9 lbs) – You might start to wonder why you need to have extra weight for storing fats and nutrients. This is key for baby’s delivery and breastfeeding. Delivery is an exhausting and high calorie output activity. Your body also uses a lot of calories to make breast milk. 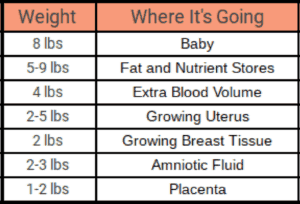 Extra blood volume (4 lbs) – Your body’s amount of blood increases during pregnancy to help your baby grow and develop. Growing Uterus (2-5 lbs) – Your uterus grows throughout pregnancy to accommodate your growing baby. Growing Breast Tissue (2 lbs) – Your breasts may begin to grow as soon as you are pregnancy. For other women, they may not notice this change until closer to their baby’s delivery. Your breasts are changing and growing to prepare for breastfeeding. Amniotic Fluid (2-3 lbs) – Amniotic fluid surrounds your baby to keep him/her safe throughout pregnancy. Placenta (1 ½ lbs) – Your placenta is attached to your baby and helps give him/her the oxygen and nutrition that they need during pregnancy. It also removes waste products from your baby’s blood. You’ll deliver the placenta after your baby is delivered. I just love charts, don’t you? 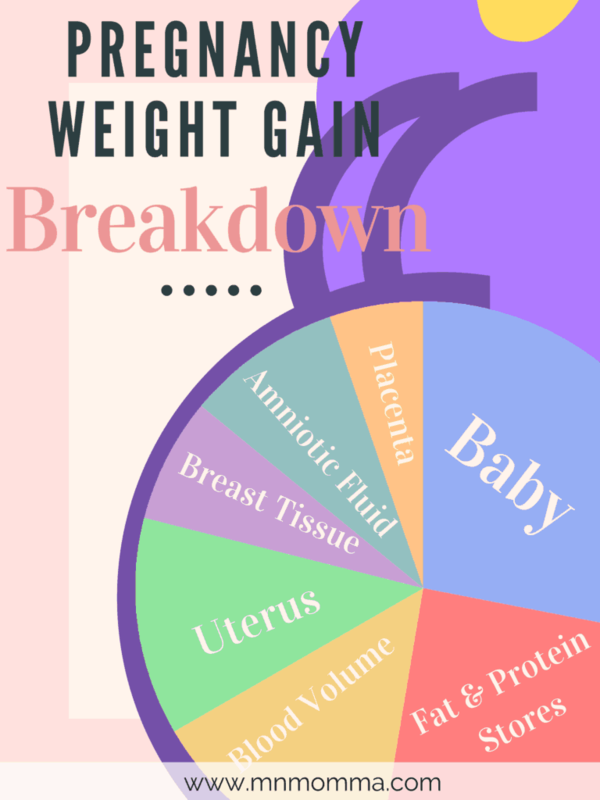 Here’s a great visual for your pregnancy weight gain breakdown! While it’s important to gain weight gradually throughout your pregnancy, experts recommend that you gain less weight in your first trimester. This is because your baby is smaller and doesn’t yet need as many calories from you as your baby will later in pregnancy. Calculating your pregnancy weight gain by trimester doesn’t have to be tricky. Just follow these guidelines from the American Pregnancy Association if you fall in the normal weight category calculated above. This is about 1800 calories per day. When you enter your second trimester, your caloric needs change. Doctors and experts recommend that you gain 1 to 2 pounds per week. This is about 2,200 calories per day. 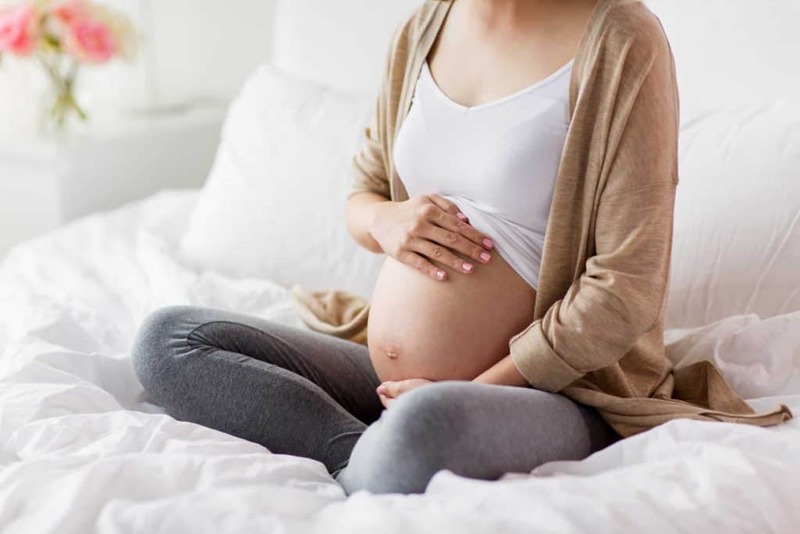 In the third and final trimester, your appetite often decreases since your baby is taking up more room and probably pushing on your stomach. It’s still recommended that you gain 1 to 2 pounds per week. Keep in mind that if you exercise frequently, are underweight or overweight, or have other medical differences, these caloric recommendations may be different. These are an estimate of your calories and suggested weight gain. Make sure to talk with your doctor about what’s right for you! Remember that every woman is different. “Eating for two” is the worst phrase ever. If you go into your pregnancy with this mantra you are extremely likely to over gain. Yes, you are eating for two now, but that does not mean you should be eating twice as much. Think of it this way, when your baby is born his/her stomach is the size of a marble. If your baby’s stomach is the size of a marble the day he/she is born, imagine how much smaller their stomach is when you’re pregnant! That being said, your body does require some extra calories due to your body working extra hard making a baby. This is where a proper diet and and great pregnancy workout routine comes into play. It can be incredibly hard to workout when you’re pregnant – especially early on when you’re likely to feel extra tired. Don’t feel you need to do it all at once. 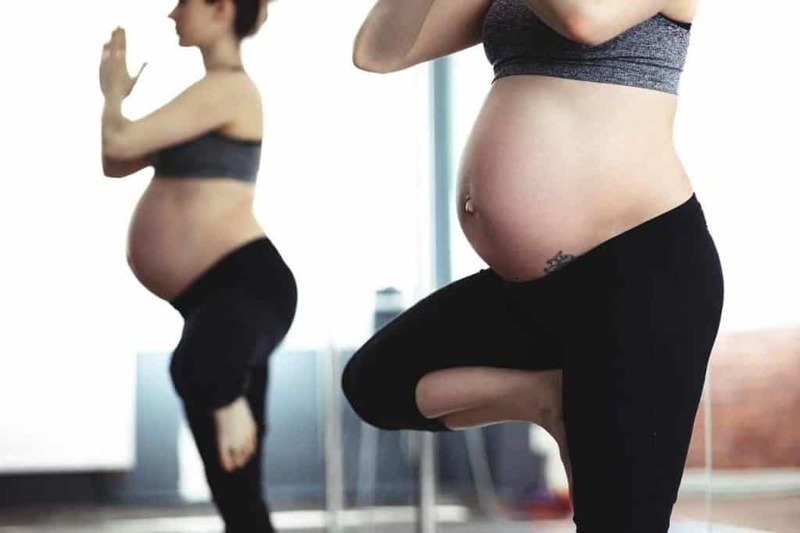 If you’re really struggling to get motivated to workout during pregnancy, check out this post on how to exercise during pregnancy even when you’re exhausted. One great stepping stone to a good fitness routine is by walking just a few minutes a day and gradually increasing. If you’ve been feeling good, it’s a great time to keep up your pre-pregnancy workout routine (as long as it’s doctor approved!). Find an exercise routine you love and you’ll be more likely to continue the routine! Tip: If you’re looking for a great, safe and effective pregnancy fitness and nutrition program – The Belly Only Pregnancy is for you! When it comes to eating, what you should be doing is eating healthy, nutritious meals. If you’re hungry try adding a healthy snack into your day. This will help ensure you’re not adding empty calories – those that have no nutritional value – into your diet, thus increasing your weight gain and not helping you feel more satisfied and full. 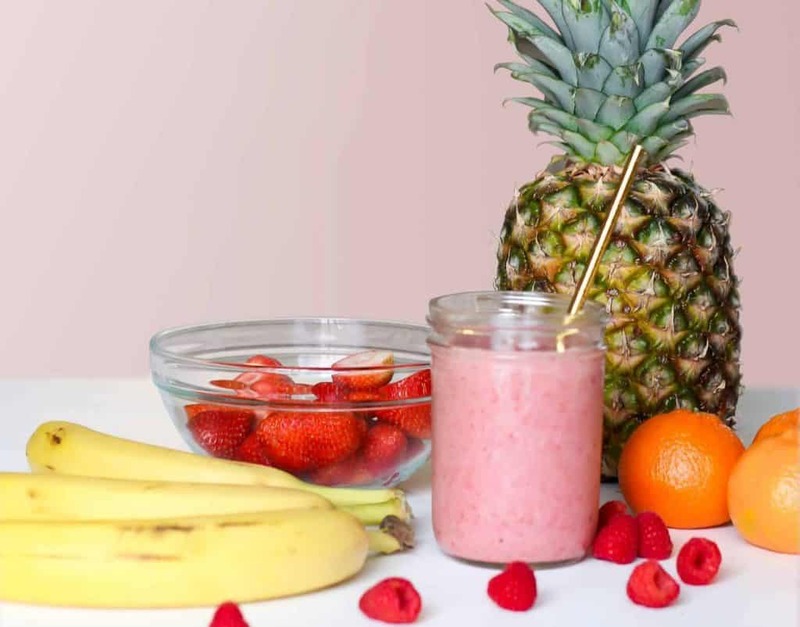 For more great ideas on the best foods to eat during pregnancy, check out this post full of pregnancy snack ideas! Some women feel so nauseous during pregnancy that they struggle to gain weight during their pregnancy. Weight gain is important for you and your baby to have a healthy pregnancy. Eat high calorie, healthy snacks. Include avocados and peanut butter in your snacks/meals to add extra healthy calories. Eat smaller meals, more frequently. This can help with nausea. Keep small meals on hand to grab on the go. If you are really struggling to keep anything down and gain weight, talk with your doctor. 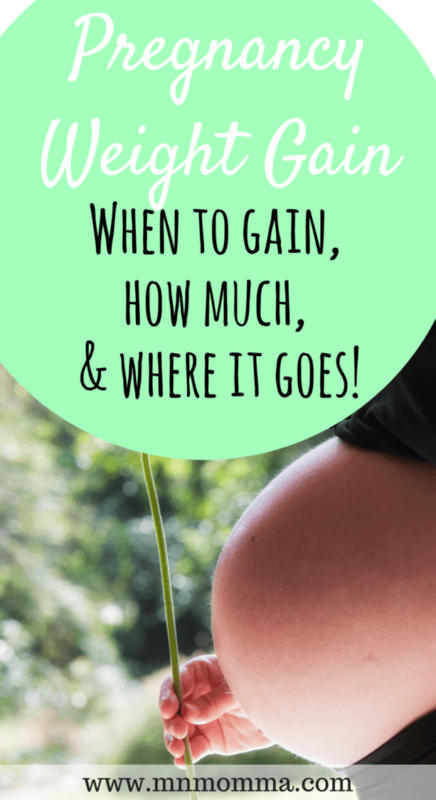 If you’re looking for more on pregnancy, you don’t want to miss my post on The #1 Pregnancy Product You Need for Peace of Mind and my Free 6-Day Breastfeeding Crash Course.